I’m always proud to say Portland, Oregon is my hometown. It has changed tremendously since I was growing up in the 1980s and 90s. Back then it felt more like a town. Now, it’s a full-blown big city. Portlanders love to complain about the increased traffic and escalating housing prices, but there are plenty of perks to go along with the growth such as better and better restaurants, interesting modern architecture and an endless array of coffee shops. The city’s booming hotel scene seems to suggest that the secret’s out and many visitors are putting it on their West Coast travel itinerary. Access to the outdoors, down to earth people and that quirky ‘Portlandia’ vibe remain part of the appeal. The Bourbon Renewal cocktail never disappoints during happy hour at Clyde Common. Clyde Common (1014 SW Stark St., 503 228-3333) the restaurant and bar adjacent to the lobby of the Ace Hotel, is our home away from home when we’re visiting family in Portland. Wylie, Justin and I are fixtures at happy hour when the Bourbon Renewal cocktail (bourbon, lemon, crème de cassis, bitters), sweet and salty popcorn and thin French fries are all a steal. The restaurant’s interior with a split-level design and a buzzy bar reminds me of New York. 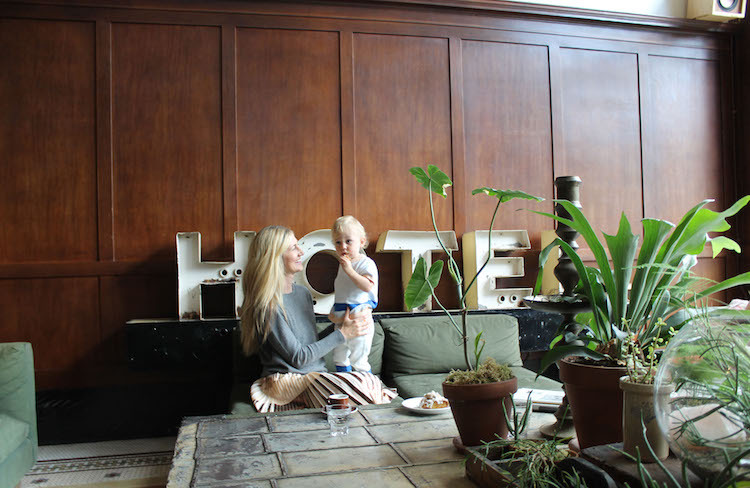 The lobby of the Ace Hotel feels like the city’s living room. Photo by Carris Bennett Christianson. While new hotels are popping up all over the city, The Ace is still my favorite. The location on Stark can’t be beat and the guestrooms are nice and bright with big windows overlooking downtown. The lobby with comfortable couches and a photo booth feels like the coolest living room of all time. Ken’s Pizza is over ten years old, but it seems like it could have opened last year. 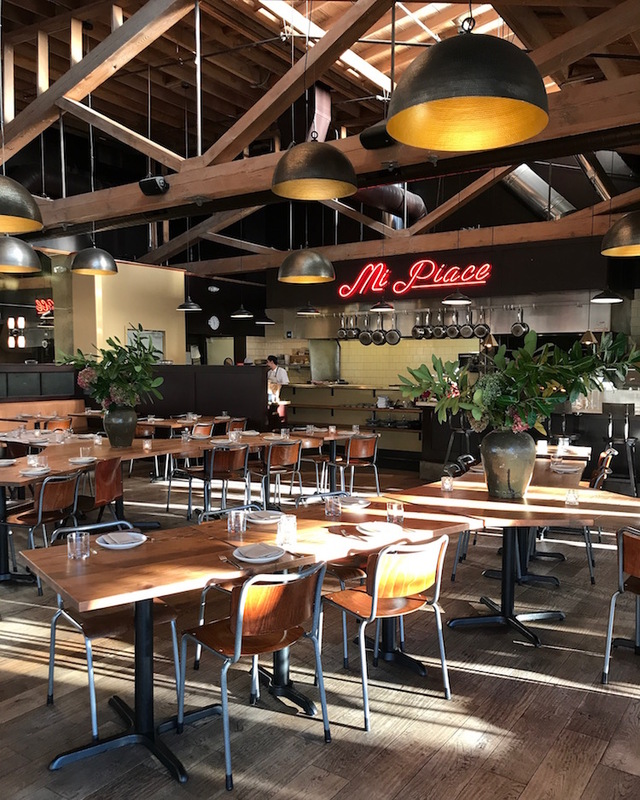 The warm space featuring wood beam ceilings made of Douglas Fir, sliding glass windows and salvaged wood tables feel timeless and epitomize rustic modern design. The pizzas blistered in an igloo-shaped Le Panyol pizza oven and topped with zesty tomato sauce, buffalo mozzarella cheese, as well as charcuterie and vegetables, are perfection. Round out your meal with the roasted vegetable plate, Caesar salad and a peppery local pinot. This leafy street on the West Side remains one of Portland’s most charming places to shop and grab a bite. While many of the spaces have changed hands over the years, there’s always a vibrant tenant mix. Some oldies but goodies include the jewelry store Twist (30 NW 23rd Pl., 503 224-0334), the furniture store Restoration Hardware (474 NW 23rd Ave., 503 228-6226), and the restaurant and bar Jo Bar & Rotisserie (715 NW 23rd Ave., 503 222-0048). Some newer additions include Will Leather Goods 816 NW 23rd Ave., 503 290-7479), and the creative ice-creamery Salt & Straw (838 NW 23rd Ave., 971 271-8168) where you can indulge in a scoop of strawberry honey balsamic with black pepper or sea salt with caramel ribbons. While it isn’t right on 23rd, make the detour to Yo! (935 NW 19th Ave., 503 841-5879) for cute baby and kids clothing, toys and cool vintage finds. There are 650 rose varieties in Portland’s International Rose Test Garden. 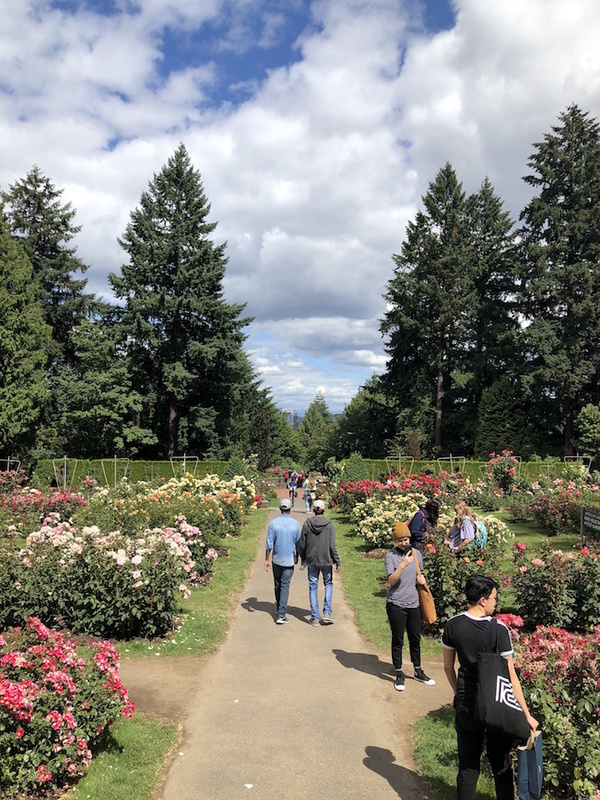 Not far from 23rdstreet, Washington Park is a 400-acre green space with running and hiking trails, a zoo, playgrounds and a variety of gardens including the International Rose Test Garden (400 SW Kingston Ave). It’s free to stroll through the beautifully landscaped and terraced gardens featuring 10,000 rose bushes and 650 varieties in every shade of pink, purple, orange, white and red. Fun fact, the garden was created in 1917 as a safe haven for hybrid roses grown in Europe during WWI. The rose garden has spectacular views of the city skyline and on a clear day you can see snow-capped Mount Hood. 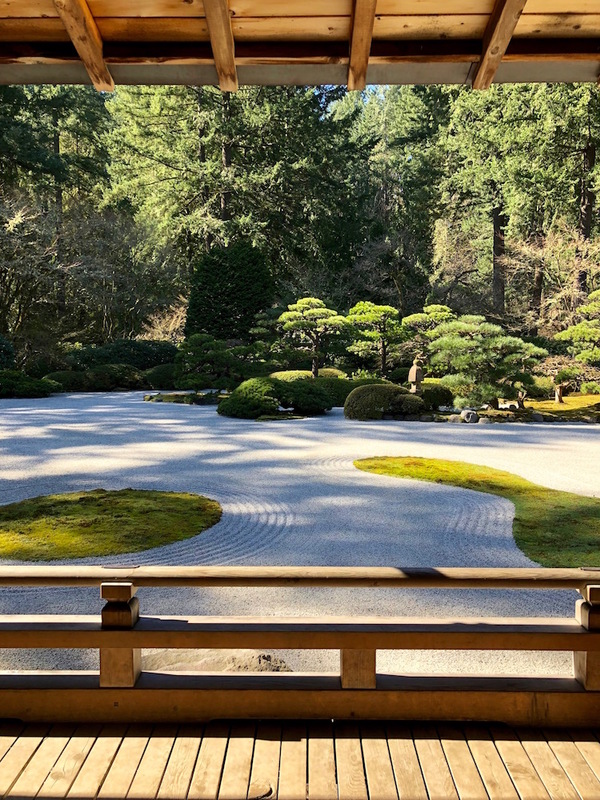 The Portland Japanese Gardens have been called the most authentic outside Japan. This inexpensive taqueria on hip Mississippi Avenue is one of the busiest restaurants in this restaurant-loving city. There’s always a line out the door at Por Que No, but don’t get too discouraged as it moves quickly and the food is well worth the wait. Tacos from tangy polo Verde to spicy shrimp with pineapple salsa, are authentic and exactly what you want on a hot summer day. The citrusy ceviche and the margaritas that can be made with seasonal agua frescas such as passion fruit and watermelon are also excellent. This 1924 building in North Portland became one of the city’s most appealing retail spaces following a renovation in 2012. The 7,000 square-foot warehouse includes first floor retail and a second-floor studio where craftspeople and designers create everything from woodwork to fragrances. Beam and Anchor showcases the work of local makers, but it’s not a prerequisite. Items for sale include handmade pottery, artsy jewelry and vintage furniture. Renata masters industrial modern design. The owners of this modern Italian restaurant met working at the French Laundry so you know they mean business. Located in a converted warehouse in Portland’s Central Eastside District, Renata has soaring exposed beam ceilings and an open kitchen with a crackling wood-fired oven. Pizzas and entrees are good, but the plates of pasta are standouts. 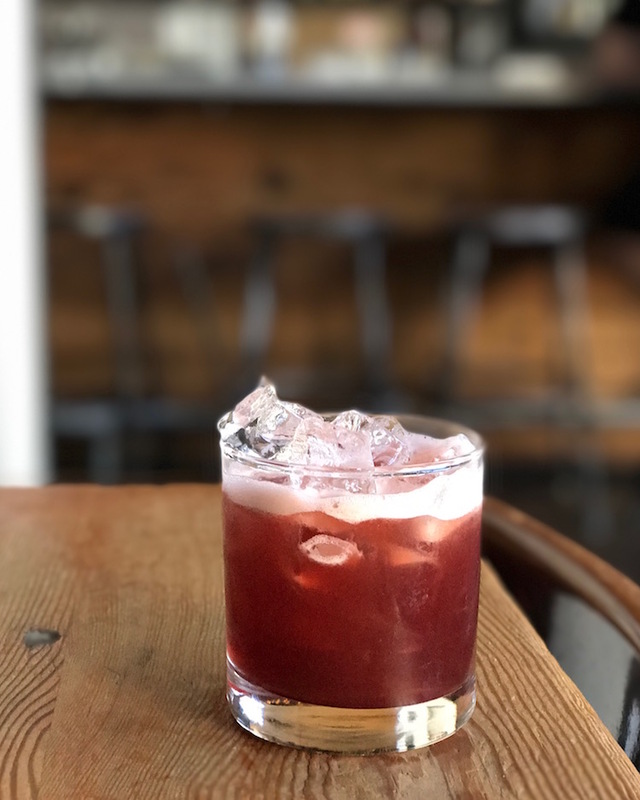 The menu is doggedly seasonal so offerings change regularly, but if the signature Isabella Scarpinocc, named for the owner’s daughter, is on the menu, don’t hesitate. Located in the boiler room of the original Victoria Theater, this dark and cavernous space is the ideal spot for a cozy, dimly lit wine bar. Les Caves specializes in low intervention, but no less delicious, wines such as Domaine des Pothiers ‘Granit Rose’ Gamay and rare Claudio Plessi Sgavata from Emilia-Romano in Italy. One of the wine bar owners also owns the winery Ovum, a strictly Oregon white wine producer and some of its offerings are always on the by-the-glass list. Half pours are available too so go out on a limb and try something new. 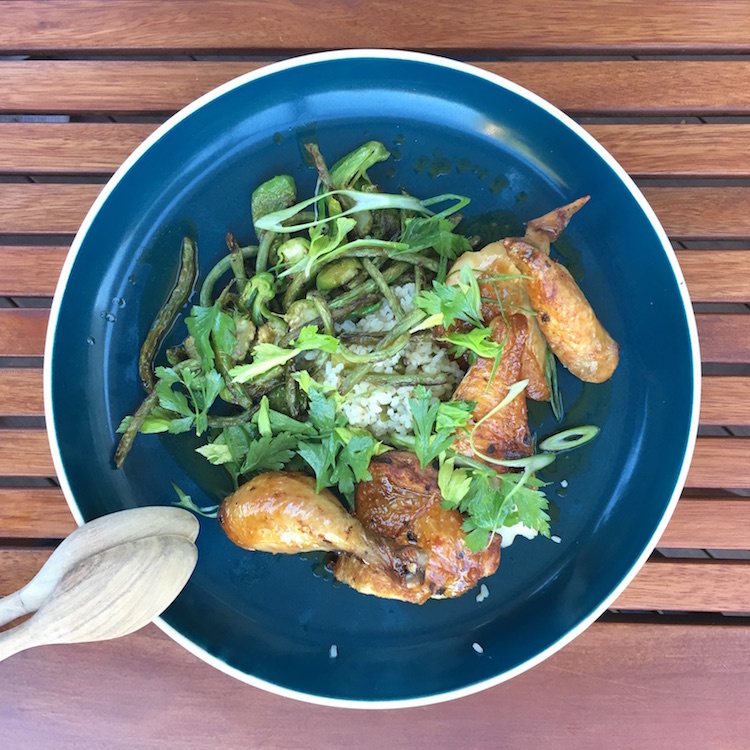 Coquine’s roast chicken is made for sharing. Portland has a number of wonderful French restaurants, but the unassuming corner restaurant Coquine, located at the base of Mount Tabor, is my favorite. The menu featuring a half or whole roast chicken, chicken liver mousse with seasonal compote and a variety of composed vegetable dishes reminds me of the bistronomie currently being served at the best Parisian bistros, but the restaurant ambiance, a historic storefront with wood floors and tables and a nice outdoor patio, is pure Portland. Portland is one of the country’s most bike-friendly cities. Its wide bike lanes and river crossings reserved for bikes and pedestrians make it a fun and easy way to get around town. Rent bikes at River City on the East Side, or the Bike Gallery, which has locations on the East Side and downtown, and head to the Waterfront. Do a leisurely loop along the river sticking to the wide esplanades and crossing at the Steel Bridge and Tilikum Crossing. If you want a longer ride, continue all the way to the Sellwood Bridge. This map will help. Have any favorite Portland spots I’ve missed? Let me know in the comments below. Heading to the Willamette Valley wine country? More on my favorite wineries to visit here. Slider photo by Carris Bennett Christianson.